Ethernet based communication and Internet Protocol/Transmission control protocol (IP/TCP) is emerging at all levels of mass communication. The introduction of PoE (Power over Ethernet) is expected to transform industrial-based networking systems. Majority of the installed wireless Local Area Network (LAN) and VoIP telephones are already equipped to receive power via Ethernet connection. Wireless LAN access points, VoIP protocols, remote security cameras, and fire alarms are some of the devices which are used in industrial-based networking systems. Increasing demand for fast and cost-effective communication owing to growing number of internet users is expected to drive the Power over Ethernet (PoE) market over the forecast period. Growing demand for VoIP services are fundamental factors boosting the IP Telephony and PoE injector market over the forecast time frame. Most of the prominent IP telephony solution providers are based in developed countries, having presence in developing countries as well. North America region held the dominant market share for IP telephony followed closely by Asia Pacific. Multiple VoIP solutions and services based in Europe are offering advanced feature-rich UCaaS (Unified communications as a service) services. Demand for resilient and secure infrastructure is crucial as governments and private organizations are also looking for advanced technologies for improved security. Continuous investments in infrastructure such as railways, roads, airports, and communication networks are fuelling the demand for video surveillance and VSaaS solutions, thereby boosting the PoE injectors market. Burgeoning modern retail outlets and hospitality sector is expected to increase the demand for CCTV cameras during the forecast timeline. Surveillance is an important task in order to prevent shoplifting and also to keep a tab on other activities of attendants and customers in each sector, thereby indirectly fueling the PoE injector market. The Institute of Electrical and Electronics Engineers (IEEE) is responsible for maintaining and creating PoE standards. IEEE 802.3af standard supports the power delivery over Ethernet up to 15.4W per port which is used to deliver the power on a variety of devices. Out of 15.4W, only 12.95W is available for powered devices as some of the power is being dissipated into cables as overheads. The IEEE 802.3at (PoE+) standard can support up to 25.5W of the power on the ports, which require more than 15.4W power when connected to PoE+ ports. As the utility of PoE has expanded beyond the networking sector, the new IEEE standard 802.3BT or PoE++ was adopted in early 2017. This standard will utilize all four twisted pairs for transmitting power. This standard will be able to achieve 49-70 Watts which will be used specifically for outdoor applications. By this standard, the new PoE injectors will be able to support Point of Sale (POS) systems, high powered PTZ cameras, and IP turrets used by financial traders, among many other applications. This new standard will allow for higher power along with supporting 10 Gbps connections. Integrated PoE solutions helps gain consumer satisfaction and trust by fulfilling requirements such as usage of latest technology, integrated high voltage power supply etc. Availability of integrated high voltage power supply in PoE injector devices provides a great opportunity to the market to expand in future. If PoE devices are well equipped with integrated power supply, it allows the manufacturers to maintain a good position in a competitive environment. In response to the same, IEEE has defined the 802.3BT standards in order to support high power requirements of devices. Lighting control is expected to offer extensive growth opportunities as applications such as smart lights incorporate the use of internet and require electrical power to function. Infotainment segment is also expected to witness high growth prospects as newer IoT based devices are being introduced in the market. Asia Pacific is expected to have high growth prospects as IoT adoption is significantly increasing in this region. Internet penetration rate is highest in North America (88.1%), followed by Europe (80.2%). Asia Pacific still holds prominent growth prospects as the penetration rate is 57.8% which is lowest as compared to the Middle East and South America. This report on the global PoE injectors market provides analysis for the period 2016–2026, wherein 2017 is the base year and the period from 2018 to 2026 is the forecast period. Data for 2016 has been included as historical information. 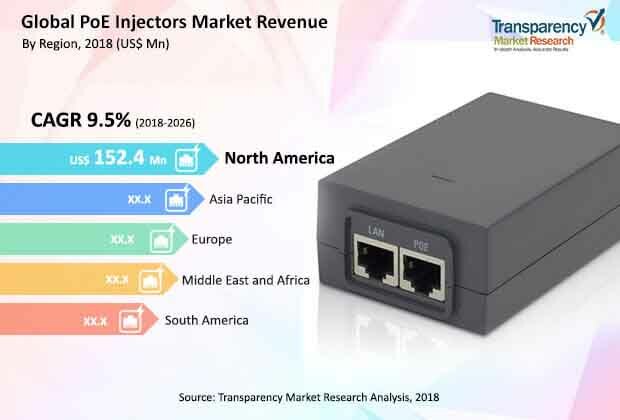 The report covers market dynamics including drivers, restraints, opportunities, and trends expected to influence the PoE injectors market growth during the said period. The study provides a comprehensive analysis on market growth throughout the above forecast period in terms of value estimates (US$ Mn) and volume shipments (Mn units), across different geographies. PoE devices are primarily used at corporate offices for flexible, easier, and faster mode of communication. There is need for less wired and easily accessible PoE switches/devices in residential areas as well. Currently, there is increasing trend of usage of PoE device in residential apartments. PoE devices are rapidly growing and are being installed in residential apartments. The advantages of PoE devices such as simple cabling, reduced installation cost, safety and convenience, and convenient maintenance makes the system reliable and trustworthy. These advantages and features make the PoE market attractive, and usage of the device is expected to grow at a good rate during the forecast period. The PoE injectors market has been segmented on the basis of type, application, installation, end-use, and geography. Based on type, the market has been segmented into single port midspan and multi-port midspan. By application, the PoE injectors industry is classified into connectivity, security & access control, lighting control, infotainment, and others. By installation, the industry is segmented into indoor and outdoor. Corporate offices, healthcare facilities, retail, communication, other industrial sectors, and residential sectors are the end-use industries. Geographically, the report classifies the industry into North America, Europe, Asia Pacific (APAC), Middle East & Africa (MEA), and South America; the regions are analyzed in terms of value and volume shipments in the PoE injectors industry. Furthermore, region- wise prominent countries covered in the report include the following – the U.S, Canada, Mexico, Germany, U.K., France, Italy, China, India, Japan, GCC, South Africa, and Brazil. The report also includes key developments in the PoE injectors market. Porter Five Force analysis which identifies bargaining power of suppliers, bargaining power of buyers, threat from new entrants, threat from substitutes, and competition scenario in the PoE injectors industry is also included in the report. Value chain analysis which shows work flow in the PoE injectors market and identifies raw material services providers and distribution channels of this industry is also covered in the report. Segment trends and regional trends have also been included in the report. It also covers segment- wise comparison matrix, incremental opportunity analysis, and market positioning of key players for all regions covered in the scope of the study. Incremental opportunity analysis identifies and compares attractiveness of the segments based on CAGR and market share index across North America, Europe, Asia Pacific, Middle East & Africa, and South America. The same has also been provided for each segment i.e. by type, by application, by installation, and by end-use. The report also includes competition landscape which includes competition matrix, market share analysis of major players in the global PoE injectors industry based on their 2017 revenues, and profiles of major players. Competition matrix benchmarks leading players on the basis of their capabilities and potential to grow. Factors including market position, offerings and R&D focus are attributed to company’s capabilities. Factors including top line growth, market share, segment growth, infrastructure facilities, and future outlook are attributed to the company’s potential to grow. This section also identifies and includes various recent developments of the leading players of the PoE injector industry. Company profiling includes company overview, major business strategies adopted, and key developments. The companies profiled in the global PoE injector market include Advantech Co., Ltd., Phihong Technology Co., Ltd., Linear Technology Corp., American Power Conversion Corporation (A.P.C.) B.V., Cisco Systems, Inc., Microsemi Corp., L-com, Inc., Sixnet Holding LLC, ICP DAS Co, Ltd. and TP-Link Technologies Co., Ltd.